The other beads are one handmade ceramic bead from Golem studio, two handmade artisan lampwork beads from GlasBeadArt, some Czech glass beads, one Bali silver bead and Bali spacers. The Bali toggle and the rest of the bracelet is also silver. You can wisit the blogs and see what everyone has made with Susan´s beads! Congratulations on winning those gorgeous beads from SueBeads. 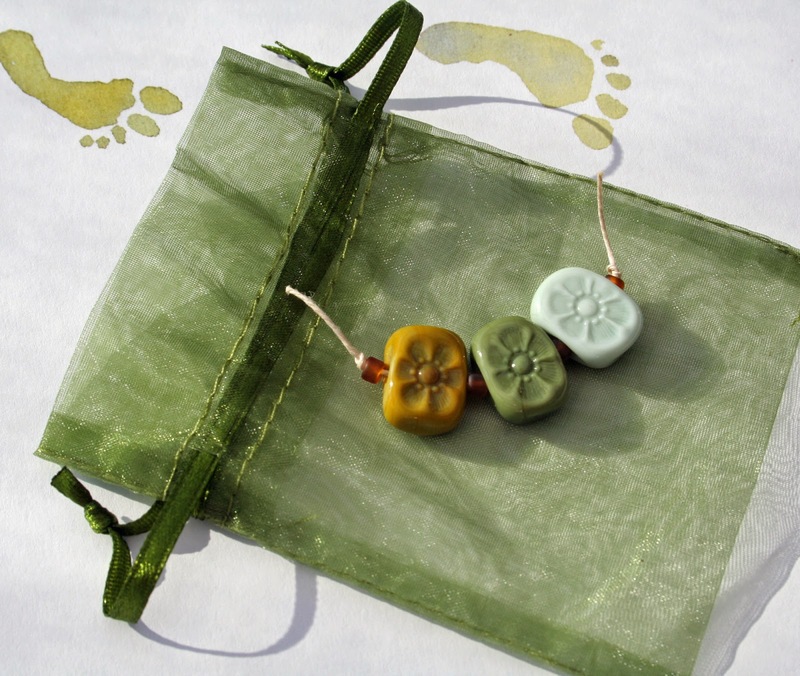 They certainly went to the perfect home to become gorgeous jewelry. 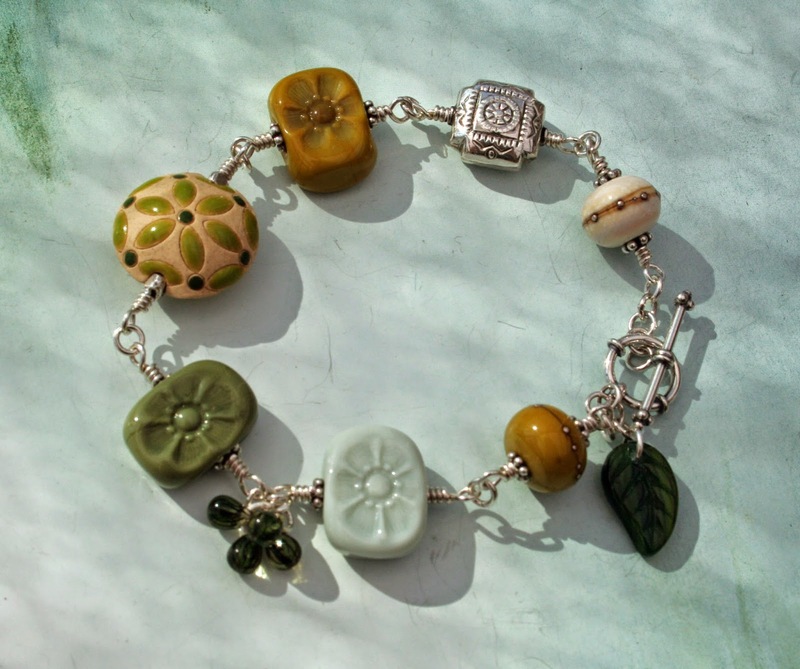 Very pretty bracelet - great combination with the Golem lentil. Lovely design, I love all the different components you've chosen, they work great together! Love your bracelet! The Golem lentil is a perfect addition! I'd wear that all the time! Merja, I love your bracelet, and all the different beads you added really bring it together, including the Golem lentil! Thanks so much for playing along, and have a great time in Dublin! Ooh its great! The Golem bead is such a perfect complement to Sue's chiclets. I like the leaf and drop dangles as well! Lovely! Gorgeous bracelet! Perfect for wearing in Dublin (one of my favorite places). Enjoy your holiday. And thanks for reading AJE and for participating in our design challenge! This is a beautiful bracelet. All the beads you used are perfect for the flower chicklets. Lovely. What a lovely piece! I love all the beads you use and they work so well together. Beautiful! Love the colors and the additional beads you chose. Everything looks great together! Beautiful! I love the color palette you got, and the silver with it is just perfect. And the Golem bead seems made for the bracelet! Well done! Those are some of my favorite colors also. Pulling them together with the Golem lentil was inspired. I love your bracelet!! The colors are gorgeous and the other art beads you combined with Sue's chicklets are perfect. The whole thing is wonderful! Enjoy your holiday wearing the gorgeous bracelet! What a gorgeous woodsy and summery bracelet Merja! I love to see warm tones combined with silver—I really think it's such a lovely harmony of elements and styles. I'd happily wear it any day!